The Bronze Age in the astronomy and mathematics. In Mesopotamia, the Mesopotamia Bronze Age began about 2900 BC and ended with the Kassite period. The usual tripartite division into an Early, Middle and Late Bronze Age is not used. Instead, a division primarily based on art-historical and historical characteristics is more common. The cities of the Ancient Near East housed several tens of thousands of people. Ur in the Middle Bronze Age and Babylon in the Late Bronze Age similarly had large populations. In Ancient Egypt, the Bronze Age begins in the Protodynastic period, c. 3150 BC. The archaic early Bronze Age of Egypt, known as the Early Dynastic Period of Egypt, immediately follows the unification of Lower and Upper Egypt, c. 3100 BC. It is generally taken to include the First and Second Dynasties, lasting from the Protodynastic Period of Egypt until about 2686 BC, or the beginning of the Old Kingdom. With the First Dynasty, the capital moved from Abydos to Memphis with a unified Egypt ruled by an Egyptian god-king. Abydos remained the major holy land in the south. The hallmarks of ancient Egyptian civilization, such as art, architecture and many aspects of religion, took shape during the Early Dynastic period. Memphis in the Early Bronze Age was the largest city of the time. The Old Kingdom of the regional Bronze Age is the name given to the period in the 3rd millennium BC when Egypt attained its first continuous peak of civilization in complexity and achievement – the first of three "Kingdom" periods, which mark the high points of civilization in the lower Nile Valley (the others being Middle Kingdom and the New Kingdom). Bronze metallurgy in China originated in what is referred to as the Erlitou (Wade–Giles: Erh-li-t'ou) period, which some historians argue places it within the range of dates controlled by the Shang dynasty. Others believe the Erlitou sites belong to the preceding Xia (Wade–Giles: Hsia) dynasty. The U.S. National Gallery of Art defines the Chinese Bronze Age as the "period between about 2000 BC and 771 BC," a period that begins with Erlitou culture and ends abruptly with the disintegration of Western Zhou rule. Though this provides a concise frame of reference, it overlooks the continued importance of bronze in Chinese metallurgy and culture. Since this is significantly later than the discovery of bronze in Mesopotamia, bronze technology could have been imported rather than discovered independently in China. While there may be reason to believe that bronzework developed inside China separately from outside influence, the discovery of European mummies in Xinjiang suggests a possible route of transmission from the West. The Shang Dynasty of the Yellow River Valley rose to power after the Xia Dynasty. While some direct information about the Shang Dynasty comes from Shang-era inscriptions on bronze artifacts, most comes from oracle bones — turtle shells, cattle scapulae, or other bones – which bear glyphs that form the first significant corpus of recorded Chinese characters. The Chinese bronze artifacts generally are either utilitarian, like spear points or adze heads, or "ritual bronzes", which are more elaborate versions in precious materials of everyday vessels, as well as tools and weapons. Examples are the numerous large sacrificial tripods known as dings in Chinese; there are many other distinct shapes. Surviving identified Chinese ritual bronzes tend to be highly decorated, often with the taotie motif, which involves highly stylized animal face(s). These appear in three main motif types: those of demons, of symbolic animals, and of abstract symbols. Many large bronzes also bear cast inscriptions that are the great bulk of the surviving body of early Chinese writing and have helped historians and archaeologists piece together the history of China, especially during the Zhou Dynasty (1046-256 BC). Aegean Collapse has also been attributed to the fact that as iron tools became more common, the main justification for the tin trade ended, and that trade network ceased to function as it did formerly. The colonies of the Minoan empire then suffered drought, famine, war, or some combination of those three, and had no access to the distant resources of an empire by which they could easily recover. Archaeological findings, including some on the island of Thera, suggest that the centre of Minoan Civilization at the time of the eruption was actually on Thera rather than on Crete . According to this theory, the catastrophic loss of the political, administrative and economic centre by the eruption as well as the damage wrought by the tsunami to the coastal towns and villages of Crete precipitated the decline of the Minoans. A weakened political entity with a reduced economic and military capability and fabled riches would have then been more vulnerable to human predators. Indeed, the Santorini Eruption is usually dated to c. 1630 BC, while the Mycenaean Greeks first enter the historical record a few decades later, c. 1600 BC. Thus, the later Mycenaean assaults on Crete (c.1450 BC) and Troy (c.1250 BC) are revealed as mere continuations of the steady encroachments of the Greeks upon the weakened Minoan world. The Yamna culture is a late copper age/early Bronze Age culture of the Southern Bug/Dniester/Ural region (the Pontic steppe), dating to the 36th–23rd centuries BC. The name also appears in English as Pit Grave Culture or Ochre Grave Culture. The Catacomb culture, c. 2800–2200 BC, is several related early Bronze Age cultures occupying what is presently Ukraine. 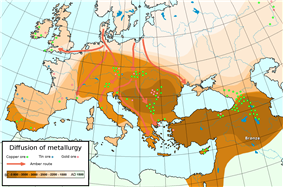 The Srubna culture was a Late Bronze Age (18th–12th centuries BC) culture. It is a successor to the Yamna culture, the Pit Grave culture and the Poltavka culture. The Moche civilization of South America independently discovered and developed bronze smelting. Bronze technology was developed further by the Incas and used widely both for utilitarian objects and sculpture. Later appearance of limited bronze smelting in West Mexico (see Metallurgy in pre-Columbian Mesoamerica) suggests either contact of that region with Andean cultures or separate discovery of the technology. The Calchaquí people of Northwest Argentina had a Bronze technology. Although North Africa was influenced to a certain extent by European Bronze Age cultures (for example, traces of the Bell beaker tradition are found in Morocco), it has long been believed that Africa did not have its own metallurgy traditions until the Phoenician colonization (ca. 1100 BC) of North Africa, and that it remained attached to the Neolithic way of life. The civilization of Ancient Egypt, whose influence did not extensively cover Africa outside of the Nile's reach, was believed to be the sole exception to this rule as regards the whole range of ancient cultures of Africa. Recently, however, some discoveries have been made that appear to contradict these views. In the Termit region of eastern Niger, its ancient inhabitants are now thought to have become the first iron smelting people in West Africa and among the first in the world at around 1500 BC. Iron and copper working then continued to spread southward to Nigeria, and then moved elsewhere in the continent, reaching South Africa around AD 200. The widespread use of iron revolutionized the Bantu-speaking farming communities who adopted it, driving out and absorbing the rock tool using hunter-gatherer societies they encountered as they expanded to farm wider areas of savannah. The technologically superior Bantu-speakers spread across southern Africa and became wealthy and powerful, producing iron for tools and weapons in large, industrial quantities. ^ Bronze was independently discovered in the Maykop culture of the North Caucasus as early as the mid-4th millennium BC, which makes them the producers of the oldest known bronze. However, the Maykop culture only had arsenical bronze, a naturally occurring alloy. Other regions developed bronze and its associated technology at different periods. ^ Amélie Kuhr. The Ancient Near East, c. 3000–330 BC. Page 9. ^ Dalton, O. M., Franks, A. W., & Read, C. H. (1905). The treasure of the Oxus: With other objects from ancient Persia and India. London: British Museum. ^ . Quote: "First coined in 1881 by the French Egyptologist G. Maspero (1896), the somewhat misleading term "Sea Peoples" encompasses the ethnonyms Lukka, Sherden, Shekelesh, Teresh, Eqwesh, Denyen, Sikil / Tjekker, Weshesh, and Peleset (Philistines). [Footnote: The modern term "Sea Peoples" refers to peoples that appear in several New Kingdom Egyptian texts as originating from "islands" (tables 1-2; Adams and Cohen, this volume; see, e.g., Drews 1993, 57 for a summary). The use of quotation marks in association with the term "Sea Peoples" in our title is intended to draw attention to the problematic nature of this commonly used term. It is noteworthy that the designation "of the sea" appears only in relation to the Sherden, Shekelesh, and Eqwesh. Subsequently, this term was applied somewhat indiscriminately to several additional ethnonyms, including the Philistines, who are portrayed in their earliest appearance as invaders from the north during the reigns of Merenptah and Ramesses Ill (see, e.g., Sandars 1978; Redford 1992, 243, n. 14; for a recent review of the primary and secondary literature, see Woudhuizen 2006). Hencefore the term Sea Peoples will appear without quotation marks.]" ^ The End of the Bronze Age: Changes in Warfare and the Catastrophe Ca. 1200 B.C., Robert Drews, p48–61 Quote: "The thesis that a great "migration of the Sea Peoples" occurred ca. 1200 B.C. is supposedly based on Egyptian inscriptions, one from the reign of Merneptah and another from the reign of Ramesses III. Yet in the inscriptions themselves such a migration nowhere appears. After reviewing what the Egyptian texts have to say about 'the sea peoples', one Egyptologist (Wolfgang Helck) recently remarked that although some things are unclear, "eins ist aber sicher: Nach den agyptischen Texten haben wir es nicht mit einer 'Volkerwanderung' zu tun." Thus the migration hypothesis is based not on the inscriptions themselves but on their interpretation." ^ Finkelstein, Israel. "Ethnicity and origin of the Iron I settlers in the Highlands of Canaan: Can the real Israel stand up?." The Biblical archaeologist 59.4 (1996): 198-212. ^ Finkelstein, Israel. "The archaeology of the United Monarchy: an alternative view." Levant 28.1 (1996): 177-187. ^ Lukas de Blois and R. J. van der Spek. An Introduction to the Ancient World. Page 14. ^ Hansen, M. H. (2000). A comparative study of thirty city-state cultures: An investigation conducted by the Copenhagen Polis Centre. Copenhagen: Det Kongelike Danske Videnskabernes Selskab. Page 68. ^ Chang, K. C.: "Studies of Shang Archaeology", pp. 6–7, 1. Yale University Press, 1982. ^ Chang, K. C.: "Studies of Shang Archaeology", p. 1. Yale University Press, 1982. ^ Also known as the Yin Dynasty. ^ Thorp, R. L. (2005). China in the early bronze age: Shang civilization. Philadelphia: Univ. of Pennsylvania Press. ^ Shaughnessy, E. L.: "Sources of Western Zhou History", pp. xv–xvi. University of California Press, 1982. ^ Shaughnessy, E. L. "Sources of Western Zhou History", pp. 76–83. University of California Press, 1982. ^ Higham, C., Higham, T., Ciarla, R., Douka, K., Kijngam, A., & Rispoli, F. (2011). The Origins of the Bronze Age of Southeast Asia. Journal of world prehistory, 24(4), 227-274. ^ O’Reilly, D.J.W. 2003. Further evidence of heterarchy in Bronze Age Thailand. Current Anthropology 44:300-306. ^ Cities on the Sea., Swiny, S., Hohlfelder, R. L., & Swiny, H. W. (1998). Res maritimae: Cyprus and the eastern Mediterranean from prehistory to late antiquity : proceedings of the Second International Symposium "Cities on the Sea", Nicosia, Cyprus, October 18–22, 1994. Atlanta, Ga: Scholars Press. ^ Hall and Coles, p. 81–88. ^ Gimbutas, "The Beginning of the Bronze Age in Europe and the Indo- Europeans 3500–2500 BC," Journal of Indo-European Studies 1 (1973): 177.